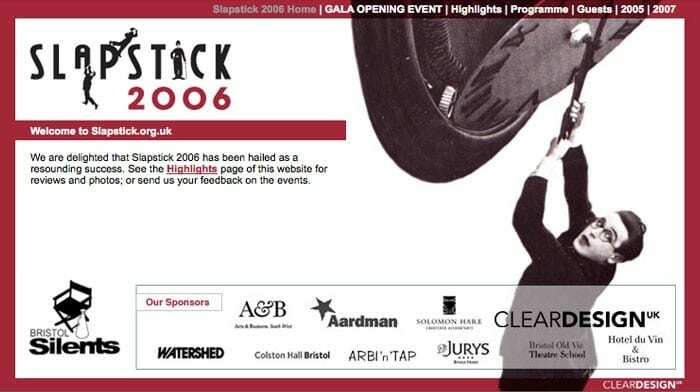 Slapstick 2006 - Slapstick | Bristol's Silent Comedy Festival. Bristol Silents in partnership with Watershed and Colston Hall presents a weekend of classic film comedy and laughter from the ‘big five’: Chaplin, Keaton, Lloyd and Laurel and Hardy through to ‘lost’ mini masterpieces from the era. Hosted by the inimitable Paul Merton and with this year’s special festival guest former silent comedy child star Baby Peggy (Diana Serra Cary) on her first ever UK appearance. Along with exemplary musical accompaniments from the finest exponents in Europe, Slapstick 2006 promises a weekend bursting with outstanding talents and classic movie magic. Bristol Silents members unless otherwise stated.